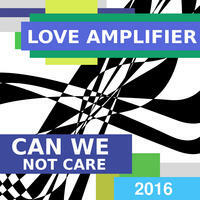 Love Amplifier : Can We Not Care. Can We Not Care is a track-by-track remix of 2008's "Creation" by CWNC2008, the original name of Love Amplifier on Myspace. These tracks have served as the basis for every album since then, including each half of a double album. This remake was produced during a single 16-hour session on the same Samsung 503C chromebook used to produce "In Our Memory". The album art is a recreation of the original album art produced in Adobe Photoshop, using Chrome's Boxy SVG.